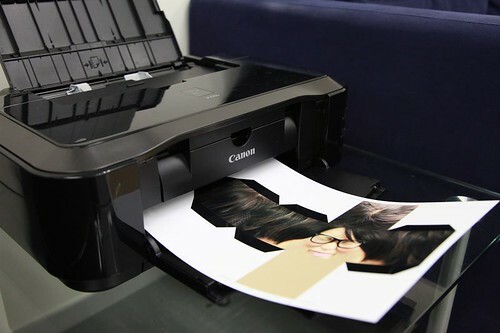 THE PASSAGE OF TIME: NEW CANON PRINTER! 《攝印有咩好玩》四四正正盒仔人 x iP4760, originally uploaded by Canon Enjoy Photo. Got a new printer! The Canon iP4760! Prints documents, photos and prints on CDs. Prior to this I had been waiting for the Epson Artisan 800 (also known as TX800W for Asian markets here) which is a more versatile AIO (All-In-One) printer, because it also does scan and fax too. But alas, while its already on clearance sale and heavily discounted in the US, it has not arrive at this region yet. Considering the fact that I already have an older but fully functional Canon scanner, I gave up waiting for the AIO printer and went for the Canon iP4760. For $199/- I get a $50 rebate in shopping vouchers, a free LED digital retro clock, and 15 months on site warranty. Pretty decent deal, not great, but good enough for me. And print quality is much better at 9600 dpi since its a dedicated printer, thats quite important to me! It's a great deal and the colour looks nice and classic! How the quality when printing photo?